Obituary – Henriksen, Ellen (Bowles) « Perry High School Alumni Association, Inc.
Ellen Henriksen, 92, former resident of Perry, died early Saturday, Feb. 8,1992, at the Methodist Manor in Tulsa. Graveside rites tentatively are scheduled for 2 p.m. Tuesday at Grace Hill cemetery at Perry. Arrangements are under direction of Brown Funeral home of Perry. Mrs. Henriksen was the daughter of Judge William Bowles and his wife, Clara. She was born Nov. 14,1899, at Perry. She attended Lindwood college at St. Charles, Mo., and was a member of Alpha Chi Omega sorority. She was a former school teacher and was married to Alfred Henriksen. Her husband preceded her in death in 1933. 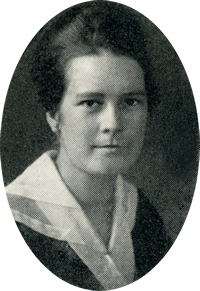 Mrs. Henriksen was a member of PEG and the Presbyterian church. She had served as organist at the First Presbyterian church of Perry. Among survivors are two sisters, Mary Maughan, Minnetonka, Minn., and Claire Pellow, CastleRock, Colo.; a sister-in-law, Marjorie Bowles, Stillwater; and several nieces and nephews. In addition to her husband, she was preceded in death by her parents and one brother, Ed.